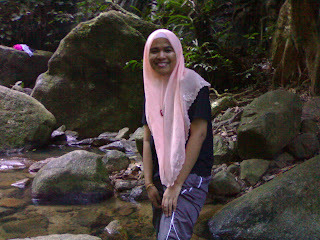 The waterfalls tuh ok-ok je la..but the best thing is, climbing up the hills..after so long not exercising..hehe.. So, pelamin siapakah ini? It belongs to one of my best friend's sister. 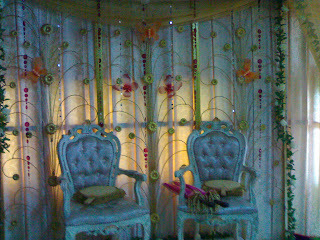 The wedding was on Saturday at Kg Telemong (really far k!). 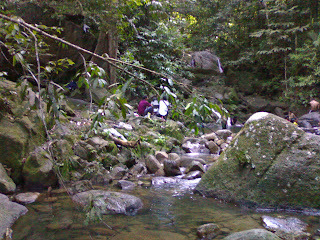 It took about 2.5 hours to get there from Kerteh. The journey back and forth took nearly 5 hours in total. But I spent only half an hour there. 30 minutes! Reason? My other friend wanted some company to watch Harry Potter at 5pm at Megamall Kuantan and later watched Ning Baizura and Senario showcase. How in the world would I say no?? Yes, I drove for 5 hours, rushing to Kuantan (luckily my friend is driving to Kuantan, back and forth), watched Harry, watched Ning..sigh..not tired at all! Ahaks..But towards the end of the day..after the showcase, nearly 11 pm..all I could think of is my bed..I really wanna sleep... Still, my friend asked me to lepak with friends at Teluk Chempedak..ngantuk k..I Have to work the next day..The rest of my friends still off on Sunday.. wow...bestnyer!! benci plak aku tgk aktiviti ngko yg mcm2 nie. alwaysss tau mcm2 aktiviti bile aku takde. masa ade...tak pernah ajak plak. even masa kau ada pun kita orang malas ajak kalau ada yg menariks hahaha...best siot ning. mantap kata anak saudara aku..
ciss...mmg kurang asam di situh! !